Somehow the rain and gloom got to me yesterday. I realize this sounds ridiculous, given where I lived for the past seven years, but the abrupt shift from the sunny 80-degree weekend to to windy and gray rain (and about 18 hours of it at that) left me feeling a bit bummed. My mood was only boosted by the fact that I scrambled into the passenger side of my car to avoid drenching my feet in the 6-inch deep puddle I parked in at the library–I am sure anyone watching thought I was off my rocker, but perhaps they needed a little entertainment anyway! 🙂 Today the sun is at least out a bit, even if it’s still chilly. 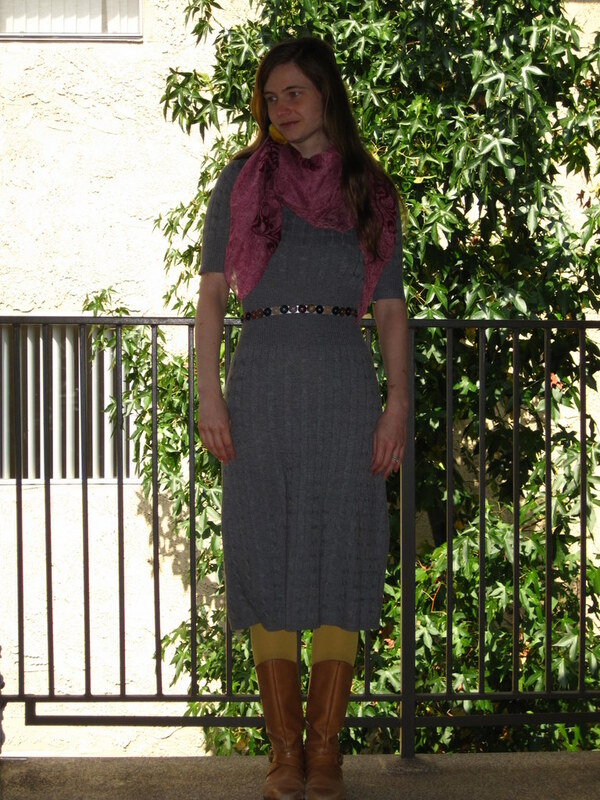 Of course, the beautiful thing about fall (okay, who am I kidding, one of the many beautiful things about fall) is that I get to wear my sweaters and scarves and boots, which have been languishing in my closet, well…since we moved here from Oakland in August. 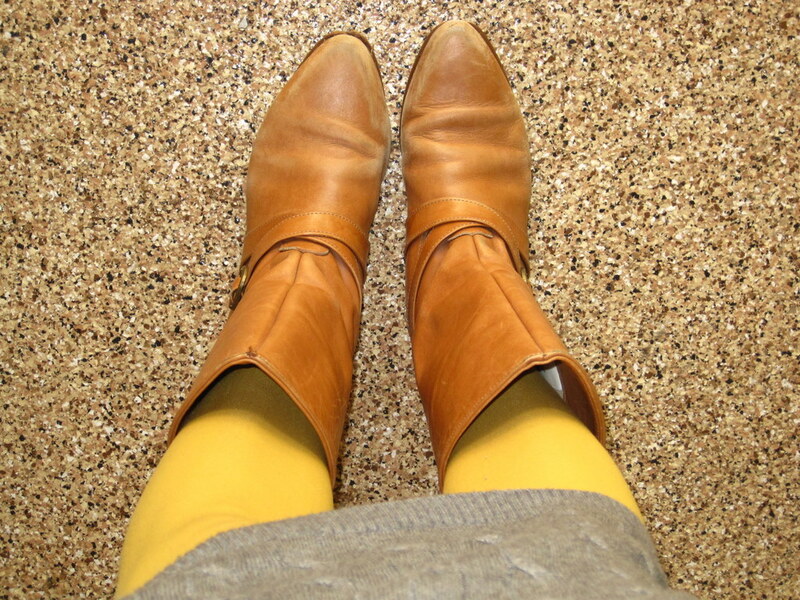 I always had this sweater dress in mind for the button belt I just finished making, and I added my favorite yellow tights and these sweet riding boots I got from a kind soul in my department. The scarf is a treasured possession of mine. I bought it in Sarajevo so that I could cover my head and visit a few mosques there, but I wore it almost every day. It reminds me of strong coffee, gorgeous hills, the palpable presence of (often tragic) history, and the sonorous call to prayer. Sarajevo is certainly one of the most amazing places I’ve ever visited. 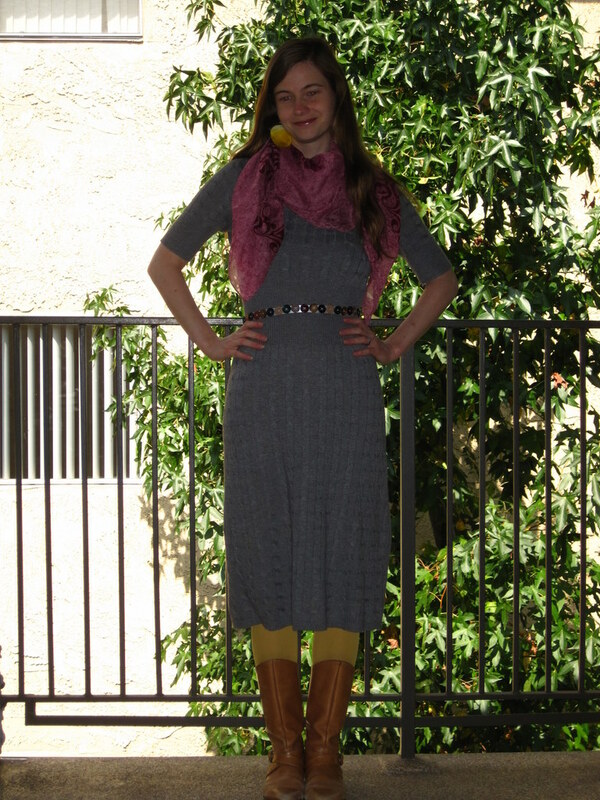 Fall is indeed the best – mostly because of the fashion! I’m so impatient for it to flippin’ get cool here in NC so I can still wear my sweaters at least for a month or two before my belly becomes basketball-esque. 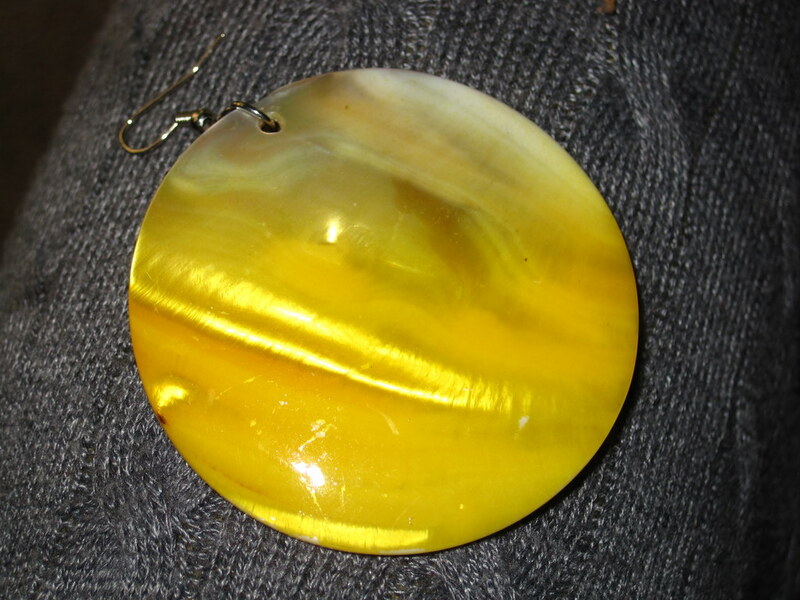 You are adorable and I simply ADORE your earrings. Are they from June Lee? And is that even the name of the place I’m thinking of? PS, I am drinking my coffee and thinking of you. A friend of mine in the department told me way back in our first year of grad school that when she went to bed at night, she was already excited about the coffee she’d drink in the morning. Me too! Hello, This is your bossy Mother speaking. Regarding the light situation there, have you considered an Ott or similar lamp that puts out a natural daytime light? You can get them in a desk or floor style, and you could use it for sewing, crafts and photography and also to make a more natural reading light in your living room. That is today’s suggestion. Ohhh, good idea! I am itching to get back to my sewing machine anyway:) We will look when we attend our standing Sunday date with the hardware store, but it looks like craft stores carry them too. Love you!